Xinhua September 9 (Reporter Liu Shilei) The Fifth China-UK Internet Roundtable was held in London on September 9. Minister of China State Internet Information Office Lu Wei and UK Minister of Culture, Media and Sport Ed Vaizey attended the roundtable and delivered keynote speech on behalf of the Chinese and British sides respectively. More than 100 representatives, most of whom were from Chinese and British government, industrial organizations, famous Internet corporations and academic institutions, attended the roundtable. Key topics of this year's meeting included: development driven by digital technology; social responsibilities of the internet; internet of things: commercial development and public life; barrier-free technology application. 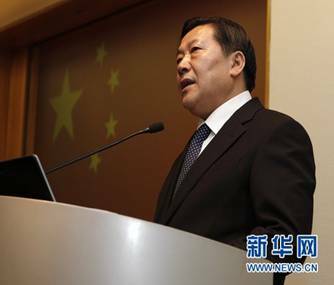 On September 9, Minister of China State Internet Information Office Lu Wei delivered a keynote speech on the Fifth China-UK Internet Roundtable held in London. In his keynote speech “Liberty and Order in Cyberspace”, Lu expounded thoroughly on the relationship between liberty and order of the Internet and advocated the establishment of international Internet order in the six aspects. First, an order of mutual respect. We should abandon prejudices, respect differences and be tolerant and open. In particular, we should respect cyber sovereignty, discard hegemony and avoid putting our own country’s interests above those of other countries. Second, an order for sharing information. We should strive to break down the information barrier and bridge the information gap. We should make information flow on the Internet freely, safely and in an orderly way, and turn it into a treasure for everyone, thus bringing more benefits to society and humanity. Third, an order for spreading positive energy. Everything we do is ultimately for the sake of spreading positive energy. Positive energy knows no boundaries. If everyone were to spread positive energy on the Internet, the world would be a much better place. Fourth, an order which is civilized and harmonious. In order to create a healthy and harmonious Internet environment, all countries should cultivate a civilized Internet, and guide their people to use the Internet in a civilized way. We should utilize the Internet to promote cultural diversity, social progress and civilization. Fifth, an order that helps maintain security. China is a victim of hacking. We have always firmly opposed all forms of Internet hacking. We hope to deepen exchanges and cooperation with other countries in online cyber security, anti-terrorism, law enforcement and privacy protection. Through joint efforts, we can build a strong foundation to safeguard cyber security. Finally, an order that features law-based governance. What we advocate is that all stakeholders of the Internet work together to build an international order for Internet governance within the UN framework that is multilateral, democratic and transparent. That will make the Internet more orderly, and better serve the development of all countries and the interests of all mankind. He said that countries across the world, including China and the UK, have more and more consensus, have more resources to share and face more opportunities for win-win cooperation. The Chinese government is committed to its basic Internet policy: active use, scientific development, law-based administration and ensured security. The Chinese Internet market is open to the world. We are willing to share the opportunities and fruits of the development of China’s Internet with the world. Lu stressed that Chinese President Xi Jinping has pointed out that it is in the common interests of the international community to uphold peace, security, openness, and cooperation in cyberspace. Both China and Britain have an important role to play and shoulder important responsibilities in establishing an international order based on Internet regulations. Lu also suggested that the two countries should strengthen cooperation by establishing a regular exchange and communication mechanism, a new mechanism for innovation cooperation, a mechanism for research and consultation, a cooperation mechanism for cyber security and a mechanism for Internet information sharing. In his keynote speech, Ed Vaizey briefed the audience on UK’s efforts to strengthen Internet infrastructure, protect legitimate rights of teenager, combat cyber crimes and promote internet of things. Mr. Vaizey expressed his hope that the two countries should further deepen communication and cooperation concerning the Internet and deepen common understanding of the Internet. Mr. Vaizey encouraged Internet companies from the two countries to increase investment and promote social progress. China-UK Internet Roundtable is cosponsored by China's State Council Information Office and the UK Department for Culture, Media and Sport and has been held for the fifth consecutive year since 2008. It has played a positive role in promoting exchanges between the Internet communities in the two countries.